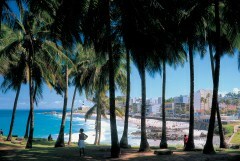 Explore Salvador, considered the country’s soul and the birthplace of Brazilian culture. The city has a lively art scene and its streets are filled with dance and music year round. Enjoy a traditional folklore show, an evening of great food, music and dance. Escape the crowds as we head to the Island of Morro de São Paulo, one of the best examples of Brazil’s diversity, with its beautiful deserted beaches and clear natural pools. These are only some of the areas attractions. Further explore the coastline and consider adding on a visit to nearby Praia do Forte. Enjoy a visit to a traditional Capoeira School to learn about the sport, its history and philosophy. On arrival in Salvador you will be met and transferred to your centrally located hotel where you will spend the next two nights. As one of Brazil’s greatest historical destinations, the city is filled with churches, homes and forts that reflect stunning Portuguese architecture from the Baroque period. The "Lower City", by the port, contains the commercial area (including the Modelo Market) where visitors will find a complete and varied assortment of Brazilian arts and crafts. It is also the best place to witness a demonstration of capoeira, a martial art developed by African slaves in Brazil, originally as a form of combat and later as a type of dance and folklore tradition. The "Upper City" can be reached by stone steps, alleyways, or the famous Lacerda Elevator. This part of the city contains the old government buildings, the residential districts, museums, churches and much of the newer architecture. This evening, you’ll enjoy a ‘Bahia by Night’ show with dinner at the Miguel de Santana Theatre. 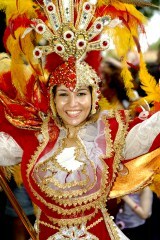 The Bahia Folklore Company (Balé Folclórico da Bahia) is one of the most respected folklore dance troupes in the world. The company performs a seamless presentation of the multiple African traditions that underpin Bahian culture within the intimate Miguel Santana Theatre in the Pelourinho. We will see the sacred dances of the Candomblé: puxada de rede, a song by fishermen in honor of Yemanjá, the goddess of the sea; maculelê, an acrobatic stick and sword dance with its origins in the cane fields; capoeira, a martial art/dance of Angolan origin; and the samba de roda, a spinning, swirling version of this exuberant national dance. After the show, dinner will be served in one of the many traditional restaurants in the area. Today we’ll enjoy a tour of the historical highlights of this colourful and surprising city. We’ll start in the modern suburb of Barra and make our way slowly by to the old historical section of town, the Pelourinho area, which contains the largest and the best preserved complex, colonial architecture in the Americas. We’ll visit the church of Sao Francisco with its exuberant gold-leafed Baroque interior and the Pelourinho Square, the heart of the old town. This tour shows two distinct aspects of Salvador - the new and the old – and concentrates on the early expansion of the city. 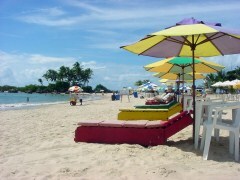 Today we’ll take you to Morro de São Paulo, a small beach community that must be reached by ferry. There are four beaches: the busiest with live music and restaurants, the most distant are natural and palm-fringed. Spend three nights at one of our delightful beach front accommodations where you can relax and enjoy a break. It is one of Brazil’s favourite destinations. Today after breakfast you’ll return by ferry to Salvador where we’ll transfer you to the airport for your outbound flight.